Team Flash discovers a connection between Julian Albert and Savitar, which leads to the discovery that Julian is Doctor Alchemy. They use him to contact Savitar in an effort to stop the god of speed. So far this season, Julian Albert has had a great character arc. While I was initially disappointed to learn he was Doctor Alchemy, I'm glad that it's turned out a lot different than I originally predicted. I love that he was an archaeologist, even wearing an Indiana Jones-style hat, and that he came to America to run away from his problems. I also like that he's not wholly evil. Yes, he's Doctor Alchemy--but he wasn't by choice. There's a chance he can redeem himself, become friends with the team, and maybe even join them. (Plus, Barry finally told Julian he's the Flash!!) I'm not ready to say goodbye to his character yet, so I'm glad he didn't die or leave. Tom Felton has done a superb job in this role. Also, the Philosopher's Stone reference was the best. Earth-3 Trickster was great. Although I was hoping for more (and the promos suggested a bigger part), I'm glad he at least made it in the Christmas episode this season. Also, Mark Hamill is wonderful. Come back next year, Trickster. It was exciting to see Jay Garrick back again. Team-ups with him are fun, and he always has the best advice for Barry. I'm glad he was around to tell Barry that the future isn't set in stone and also to lend a hand. Thank you for being wonderful, Jay. Never change. Although it's been increasingly irritating that nobody will train Wally (or believe in him), I'm glad this episode continued that thread. HR training Wally is adorable, and I think we're finally seeing HR's merit come to light. Also, I think the fact that Wally is faster than Barry will be interesting later on in the season. Can't wait! Caitlin Snow is just a wonderful human being that should never change. I adore that she's been there for Cisco during all of this and that she was the one who could help Cisco close Savitar's box. She's also smart and pretty. She's amazing. The speed force siphon along with all the Savitar fights were cool. The special effects this season have been stellar. Keep it up, CW. Christmas with Team Flash was so fun. HR's decorations and freaking out was hilarious (along with getting drunk off the eggnog). Wally receiving the speedster suit was precious. Joe and Cecile are adorable. (And they finally kissed!) Julian arriving to join in the festivities was heart-warming. (He needs friends. And a hug.) Caitlin making it snow instead of rain was the perfect touch. And of course, Barry and Iris were sweet. For once, I'm happy with their relationship. (No, I'm not crying... Okay, yes, I'm crying!) This was such a nice, happy fall finale. Almost. Cisco dealing with Dante's death this episode was heartbreaking. Not only is it the first Christmas without his brother, but Savitar tempting him with empty promises was devastating. The moment Julian told Barry his story, I was worried for Cisco. Poor Cisco. I'm glad he's forgiven Barry, but he still has a ways to go before he heals. The "Philosopher's Stone" is interesting. It create metas, which is a powerful hunk of rock. The box itself is an enigma because it physically acts as if it doesn't exist. Even though they supposedly threw it into the speed force so it's gone, I'm still worried. I'm worried that throwing something into the speed force doesn't really get rid of it but only places it in a random time. I'm worried it's going to come back and ruin everything. Basically: I'm worried about a rock. We discovered a lot about Savitar in this episode. He's the first meta with speed, which is why people regarded him as a god. But he's also from the future. (Raise your hand if you're confused.) He's still powerful, scary, and absolutely wretched. He's seeking revenge for something Barry did to him. (Surprise, surprise--story of Barry Allen's life, eh?) But the worst part was his prophecy. What does this mean? I don't know, but I'm worried over my precious Team Flash babies. Don't you dare hurt them. They've all been hurt enough. Please. Overall, wow. This episode was stellar. It had the perfect blend of fun, action, and devastating, heart-wrenching moments. 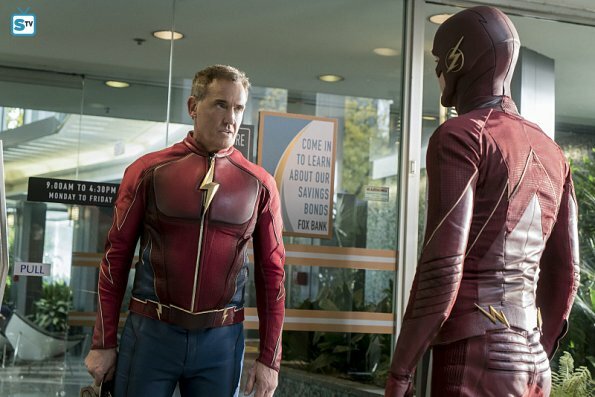 Just when you thought it couldn't get worse after Reverse-Flash ruined lives and Zoom ruined more lives, Savitar swoops in to ruin all the lives. There was a lot revealed in this episode, but there was also a lot of new threads to tide us over until the show returns in January. Too bad we can't all run to the future (though, I guess, Barry showed us why that's probably not a good idea). What did you think of "The Present"? What do you think Savitar's prophecy means for Team Flash?